Did you miss the swim leg? Check it out, here. 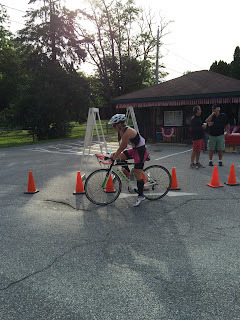 After running out of transition, I got on my bike and started the next 56 miles of the day. This bike course is tough, HITS isn't playing around here. Luckily, Mike and I knew about the big hills because if you went into it blindly, you were going to be really, really unhappy. Not that I wasn't a bit unhappy already knowing about what awaited me. 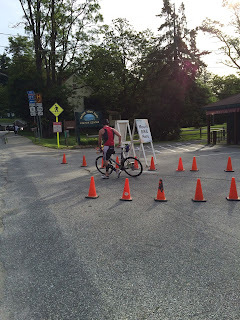 As soon as you leave transition, you take a quick left onto route 8 and that's where you stay the entire time for the bike course. It is an out and back with the turnaround at mile 28 for the 70.3 athletes and at mile 56 for the 140.6 athletes. The first 5 miles are all uphill. There are a few "breaks" thrown in there, with just enough time to sit in aero for a few seconds before you keep climbing and climbing. It took me about 40 minutes to do the first 5 miles, yes I was that slow. My MPH these first miles ranged from 5.9mph to 9.5mph, the worst part about these kinds of miles it that it really hurts my back to sit up straight that long. 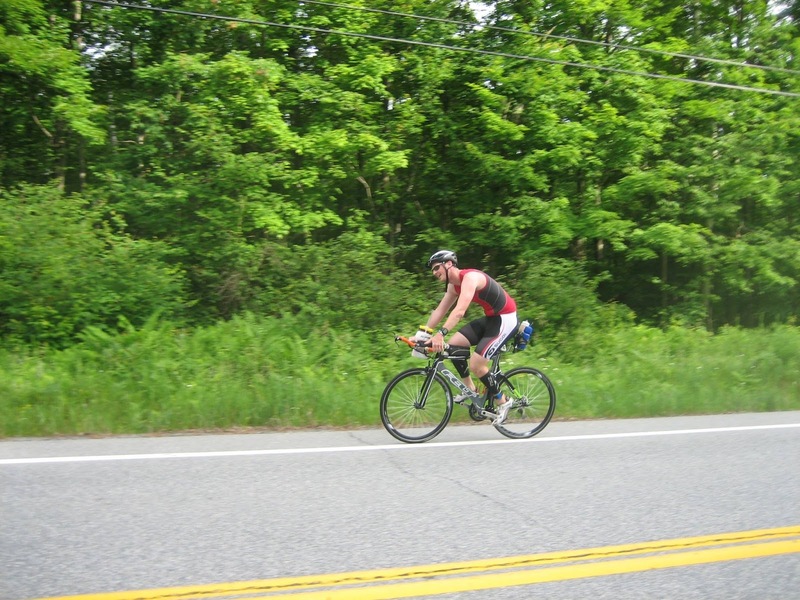 At some point, I don't really remember when since I was focusing on not sounding like a dying, wheezing animal, Mike's parents drove by me and cheered me on. Almost done with the first big hill! Our friend, Greg, told us that he was going to be on the hill somewhere. I just focused on getting to him. Around mile 4, there he was! 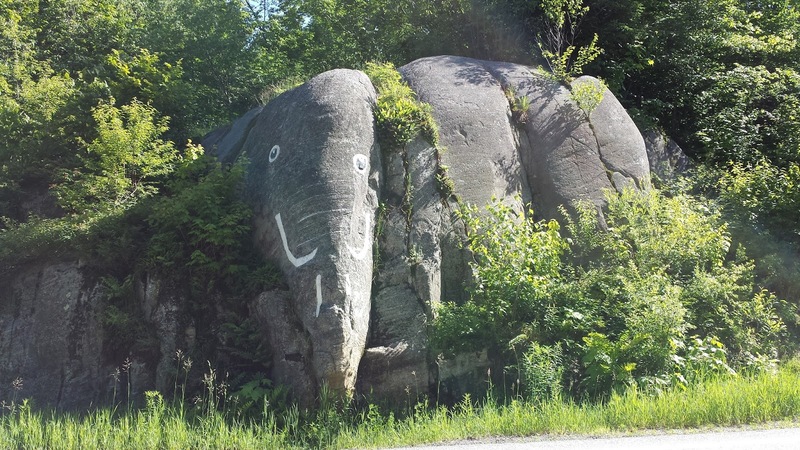 I told him that I hated the hill and he told me that the steepest parts were over and that I only had about a mile to go to the rock elephant (and mile 5). I have never been so happy to see this mile marker in my life! Some people had passed me, but that's alright I just wanted to get the hill over with! 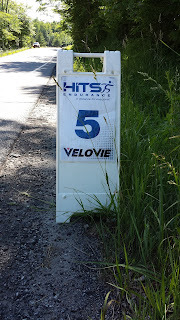 FINALLY, I saw the mile 5 marker and knew that the tough part was over (for now). The middle of the course is pretty nice. Right after the 5 mile uphill, you get a nice 4 mile downhill (which only means you have to go back up that in the end). 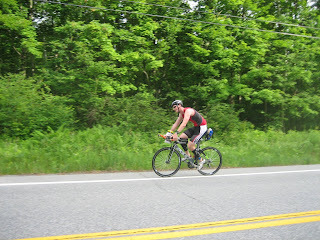 One other triathlete was drafting me before the downhill and when I looked back at him, he told me I was fine. I said, well you are technically drafting me to which he responded he was too far away to be drafting. I explained that it was 3-4 bike lengths back and he quickly went around me. Not that there were any officials out (that I saw), but I didn't want him riding me on the downhill. The 4 mile downhill gave my quads some relief and I even hit 30mph one mile. The rest of the bike to the turnaround is rolling, with one major hill at mile 27. I just took in the scenery and made sure to get my nutrition back on track (it was tough to get in a rhythm on the 5 mile uphill). I really enjoyed the ride, with the exception of the lack of shoulder on most of the road. The views were gorgeous and it wasn't too hot out at this point. Right around mile 23-25, I started to think I should see the leader coming back through. As I rounded a corner, there he was! I started to count how many people were making their way back, but once I got up to 11 or 12 I stopped counting. About mile 25, I saw Mike! I asked if he was doing alright and he said yes (honestly, I was a bit worried because I thought I'd see him sooner but I had done math wrong. I thought he was only 3 miles ahead of me, but really he was 6 miles ahead. Oops). 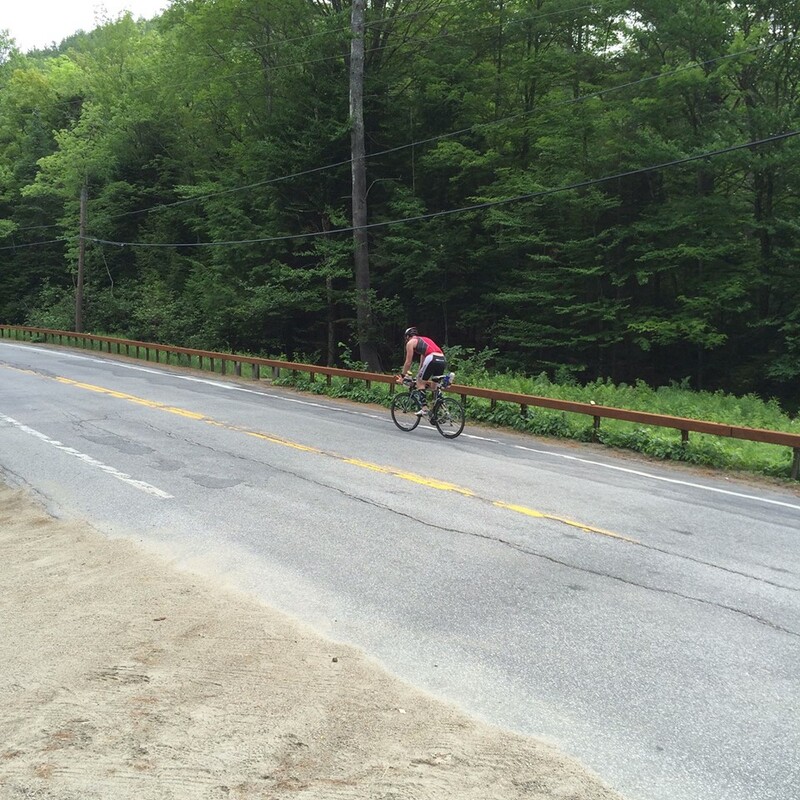 A few miles before the turnaround someone in a DC Tri Club kit passed me. I asked him if he knew Gabi and Pablo and he said yes. I explained how I knew Gabi from blogging and how all of us did Ironman Louisville last year. It is such a small world! He told me that I must be used to all of these hills and I said yes, but these were pretty bad ones! At the turnaround, which I didn't have any problems with luckily, a volunteer asked if I wanted anything and I said no. Then another person asked if I wanted something, and I said no. This same person told me that I was 11th female, which I thought was strange that a volunteer was telling me that and after a few seconds I realized that it was Mike's mom! I didn't even see his parents or the volunteer at the turnaround (I was so focused on not eating it and the cars that were waiting that I had my blinders on). 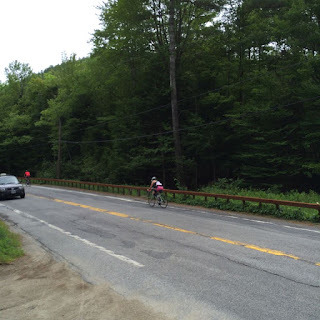 Less than 28 miles to go on the bike leg! 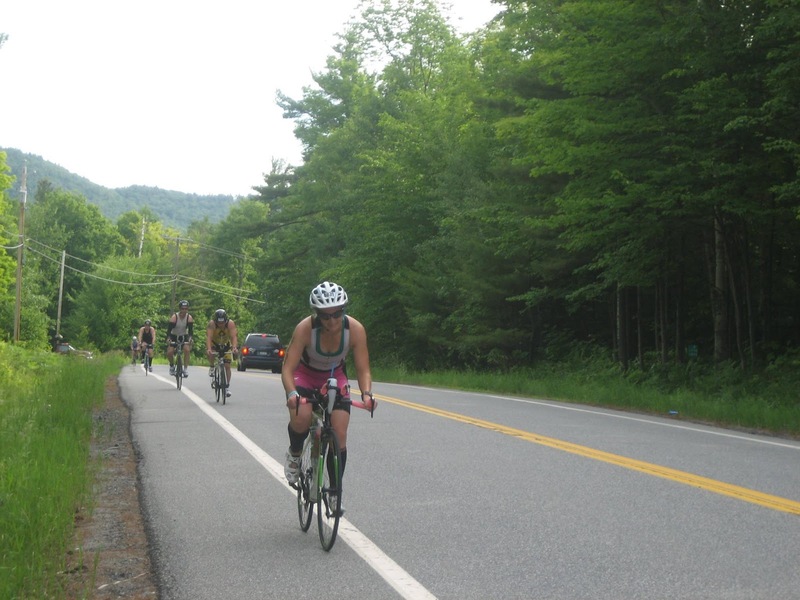 I got back on my way and knew that some other female athletes would probably pass me, there were some pretty close to me making their way to the turnaround (and one woman did pass me a few miles later). I made it up another slight hill and then continued the rollers. I was probably averaging about 16-17mph during the middle portion of the course, but I was still below 15mph average overall. The sun was starting to come out and as the miles ticked by, I knew that the final tough portion of the bike course was coming up. Right around when there were 9 miles left, we started to climb again. This hill was shorter and not as steep, but there weren't any "breaks" during it! It was constant climbing! I was near a few people at this point and we were all making our way up the hill. Right before the 5 miles of downhill, there was a guy riding on his trainer at a scenic overlook. He told me I had about 1 to 2 minutes left of climbing and then it would all be downhill from there (literally). After four miles of slow mph (between 6.6 to 10.4 mph), I was FINALLY done climbing! The last 5 miles flew by. I tried to stay in aero as much as possible, but I did have to put the brakes on a few times. The steepness and curves scared me! There were times when I couldn't even hear anything because of how fast I was going down the hill. My fastest mile of the day was 33.3 mph! Mike had close to 40 mph clocking a 39.5mph mile! Although the last 5 miles went by fast and I barely had to pedal, I still don't think that they made up for how tough the rest of the course was. I am glad it ended on a downhill, though! 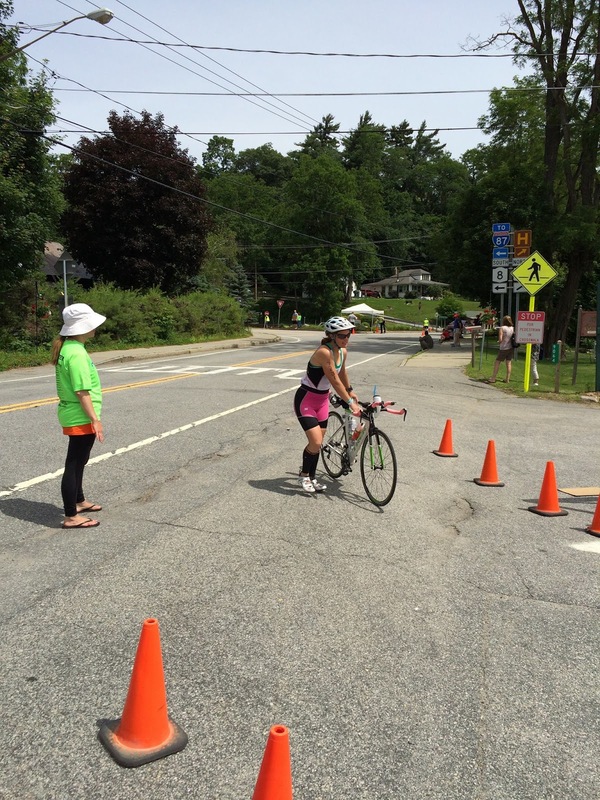 Done with the bike leg! I made it back to the turn and took the right back to transition. Mike's parents were there cheering me on, and Mike's mom said I was doing great. I didn't think I was doing great at that point, so I just said that it was a training race. I was actually worried that I wasn't going to break 7 hours since both my swim and bike legs were slower than at Musselman in 2013. I ran my bike back into transition, threw on my running stuff and made my way out on to the road to tackle the final 13.1 miles of the day! 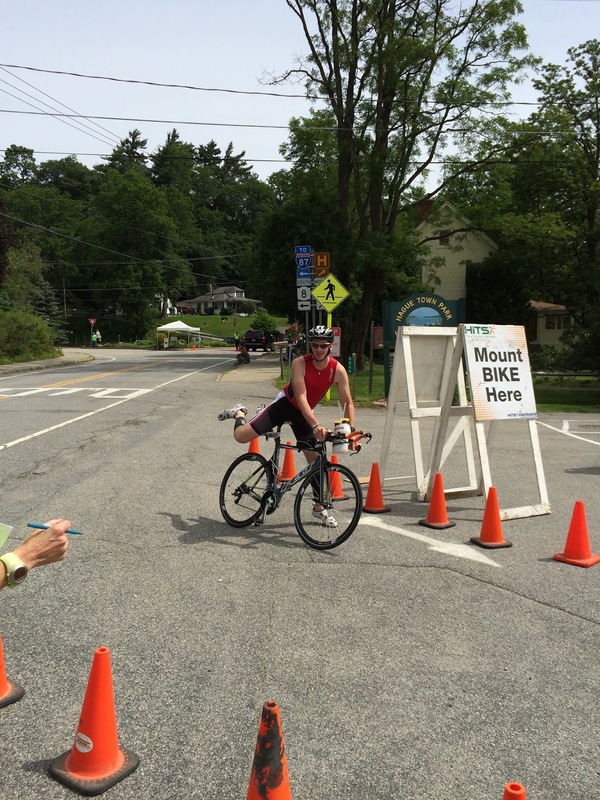 The course started with five miles of climbing?! Sheesh. That's so, so tough, especially since you weren't warmed up yet. Great job even though it was a tough course! 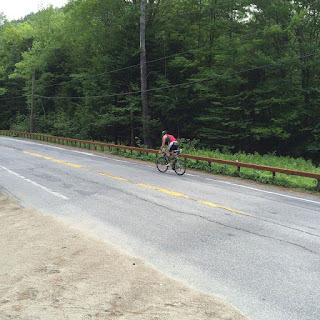 I agree- 5 miles of climbing each way (10 total)-- that's 20% of the course! Don't you hate drafters?! Where's an official when you need one? I guess I'm a perpetual rule follower though who gets irritated easily. 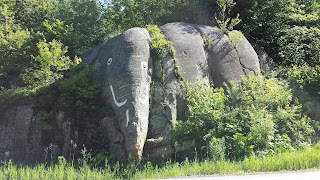 ;) Love the rock elephant! :) Nice ride, kids! Speedy. Speedy. Speedy. You did incredible AND on a tough course.